Fall is really the time of year when I start making comfort foods and Split Pea Soup is one of my favorite comfort foods. I can't stand peas, but I love Split Pea Soup. When I make it, I make it really thick and full of ham. It is truly a meal in its own right. I serve it with cornbread, and I always feel like I'm in Heaven when I take that first bite. It is also one of those meals that you can put in a pan and just let it cook for hours. Then you come back and have this wonderfully, hearty, and delicious soup. 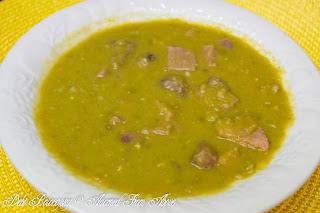 Anyway, enough with the descriptions, here is a great and simple recipe for Split Pea Soup. Rinse split peas, and then put them in a large pan. Add onions, ham, ham hocks, bay leaves, and pepper. Add 12 cups of water and bring it to a boil. Lower the heat to low and cook for 2 to 3 hours. Pull ham hocks out of the pan, take the meat off of the ham hocks and throw the rest away. Add the meat back into the soup. The soup should be really thick at this point and ready to serve. So isn't this an easy recipe for Split Pea Soup? It is a hearty, stick to your ribs meal. Add cornbread and you're set. Let me know what you think of this recipe. I always love hearing from you. I'm so happy that you like split pea soup. I hope that you like the recipe. Thanks so much for stopping by. Split pea is one of my winter favorites! I'll add this to my list! I really love this recipe. We have already had snow, so it is working for me now. Unfortunately, winter already began in Denver. At least today will be in the 70's. Have a great weekend and thanks so much for stopping by. One of my favorite soups. Saw it on 52 Mantels Link Party. I'm so happy that you stopped by. I love 52 Mantels. Emily has a great blog and great parties. That looks really tempting, delicious soup! I love split pea soup. Can't wait try your recipe. Visiting from A Diamond in the Stuff link party. That's what I want for lunch today! It looks delicious Debi! !